The Total logo in 2003. 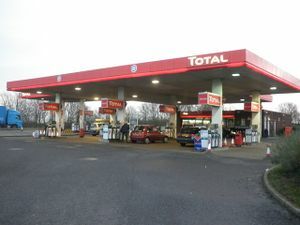 Total is the petrol brand of the large French group TotalSA. Once one of the UK's major fuel brands, Total saw two more historic brands (Elf and Fina) combine to create one recognisable name. Fina operated a number of services with Kelly's Kitchen. In 2012, Rontec bought 250 of Total's sites. The rest were sold off to other companies, while the distribution network was sold to Gulf. Most of the forecourts that were sold off are now operated using the Shell fuel brand. 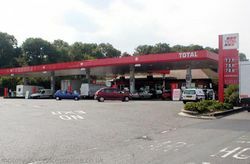 Total Convenience Stores (TCS) was the corporate title used by Total's corporate fuel forecourts, generally on the a-road network. Unlike BP's 'BP Connect' the title was not used in public communications, with 'Bonjour' being used instead. TCS tended to be used in nams and addresses only. Like their fellow petrol retailers, TCS branded their larger forecourts with their own name of convenience store, in this case Bonjour. Bonjour was sometimes also associated with an own-branded café called 'Cafe Bonjour'. Other sites include various refreshment concessions such as Nescafe & Go coffee machines and Bake & Bite facilities. Smaller services which only sold snacks were just branded as 'Shop'. Excellium was Total's own brand of fuel. It was claimed that it improved engine protection, reduced fuel consumption and produced fewer CO2 emissions. Most TCS sites were sold throughout 2012/13 to Rontec, who in turn sold most of those filling stations to Shell. The Rontec stations are now operating under the Esso brand, and the former Bonjour shops are either Shell Select or Rontec's own brand Shop 'n Drive. The final TRSA Total closed in 2016, which was a Co-op Food-owned site at Polegate on the A27.